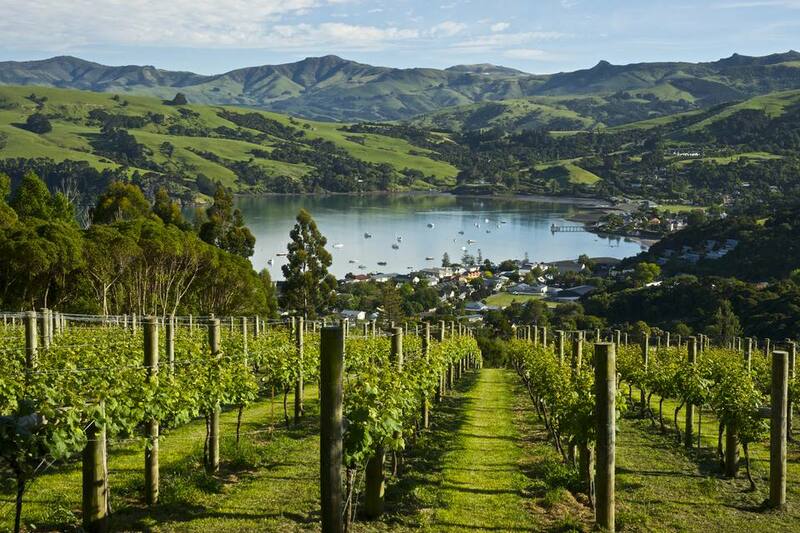 New Zealand is well known for its wines, and there are a wide number of grape varieties planted throughout the country. While the major French varieties dominate, as they do in most other wine countries, there has been increasing experimentation and success with other styles of wine. Here are the main grape varieties planted in New Zealand and a description of the types of wine they produce. Sauvignon blanc originates from the Loire Valley in France where it appears in such names as Sancerre and Pouilly-Fumé. It was first planted in New Zealand in the 1970s and it is now by far the country's most famous wine style and also accounts for the vast majority of the country's wine exports. Eighty percent of New Zealand's sauvignon blanc is grown in Marlborough, the country's largest wine region. Small amounts are also grown in Hawkes Bay, Canterbury, and Central Otago. New Zealand sauvignon blanc is a very distinctive wine. Its flavors range from capsicum and fresh cut grass to passionfruit, melon, and limes. It has a fresh acidity that makes it best drunk within four years of vintage. The great white grape of Burgundy is grown in all of New Zealand's major wine regions, with the wine made in a variety of styles. The wines from the North Island (especially in Gisborne and Hawkes Bay) are ripe and tropical in flavor and lend themselves well to aging in oak barrels. The wines from the South Island tend to be higher in acidity and are less fruity. New Zealand chardonnay can age well. Many wines are now produced without oak aging so are also appealing when young. Originally from Alsace in France (and also known as pinot grigio in Italy), pinot gris is a relatively new import into New Zealand. Winemakers are still trying to figure out a distinctive style for the grape in this country, although most are made to be dry and lightly fruity. Pinot gris suits a cooler climate, so most are grown in the South Island. New Zealand makes some magnificent Riesling wines, and the grape is very underrated. It can vary from off-dry to quite sweet, so care should be taken when selecting. The flavors can range from citric lemon/lime tones to more tropical fruits. Most Riesling in New Zealand comes from the South Island in the major regions of Nelson, Marlborough, Canterbury, and Central Otago. Gewürztraminer is made in small quantities in New Zealand but what is produced shows great potential. Lychees and apricots are the predominant flavors; the further north the wines are made the more lush and tropical is the style. It can vary from bone dry to intensely sweet. Gisborne and Marlborough are regarded as the best regions for Gewürztraminer. Pinot Noir is regarded as New Zealand's best red wine grape. With the climate of the country having similarities in some areas with Burgundy in France (from where it originates), this is perhaps not surprising. New Zealand pinot noir comes in a variety of styles. The areas known for producing the best wines are Central Otago in the South Island and Martinborough in the North Island. Excellent wines also come from Marlborough and Waipara. These two grape varieties are usually blended, as in the Bordeaux style, to make intensely flavored dry red wines. The warmer climate of the North Island is more suitable and the best wines come from Hawkes Bay and Auckland (notably Waiheke Island). The other Bordeaux varieties, cabernet franc, malbec, and petit verdot are also grown in small amounts and are often added to blends. Also known as Shiraz in Australia and originating in the Rhone Valley of France, Syrah is growing in popularity in New Zealand. It requires a warm climate to ripen properly, so the most successful wines in the country come from Hawkes Bay in the North Island. Although the style is full-bodied, it is lighter and more elegant than its Australian counterpart. New Zealand makes some very good examples of sweet wines, usually from Riesling, but often also from chardonnay or even sauvignon blanc. They are generally made from late-harvested grapes or from those infected with botrytis cinerea (a characteristic of the wines of Sauternes in France). The cool climate of the South Island has resulted in success with dry sparkling wines. Marlborough makes the best wines, usually from a blend of chardonnay and pinot noir.